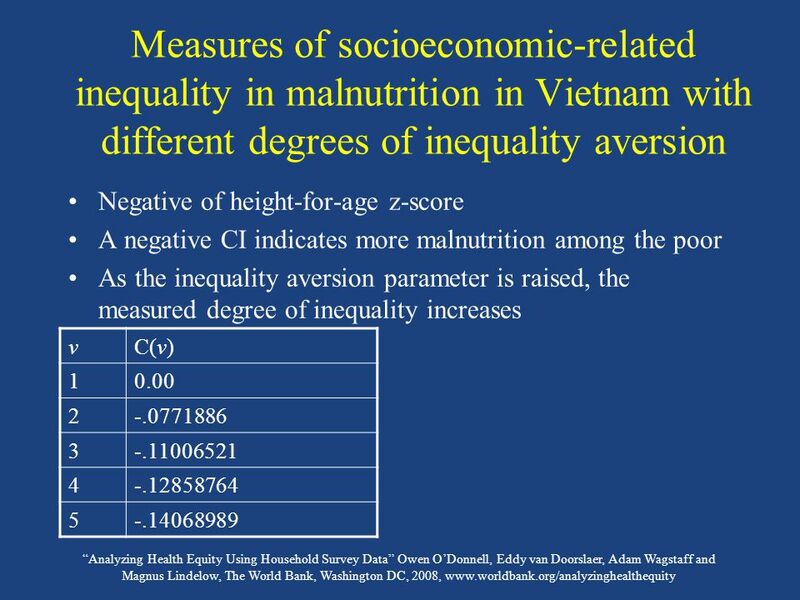 “Analyzing Health Equity Using Household Survey Data” Owen O’Donnell, Eddy van Doorslaer, Adam Wagstaff and Magnus Lindelow, The World Bank, Washington. 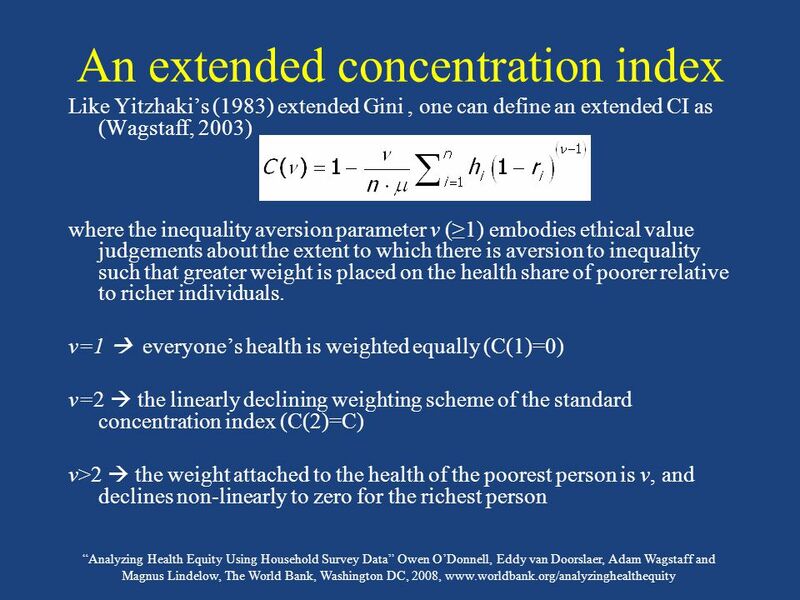 2 “Analyzing Health Equity Using Household Survey Data” Owen O’Donnell, Eddy van Doorslaer, Adam Wagstaff and Magnus Lindelow, The World Bank, Washington DC, 2008, www.worldbank.org/analyzinghealthequity Two extensions to the concentration index 1.CI incorporates implicit value judgements about aversion to inequality. It can be extended to allow different judgements. 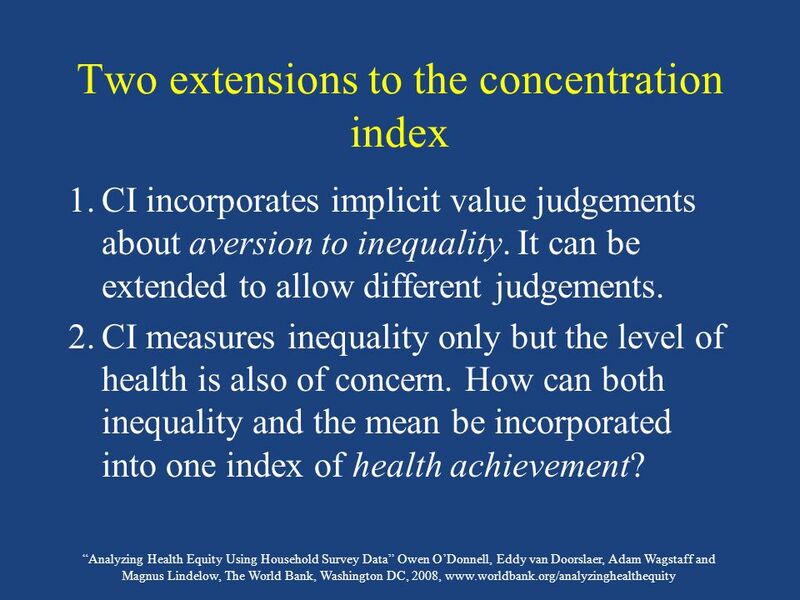 2.CI measures inequality only but the level of health is also of concern. 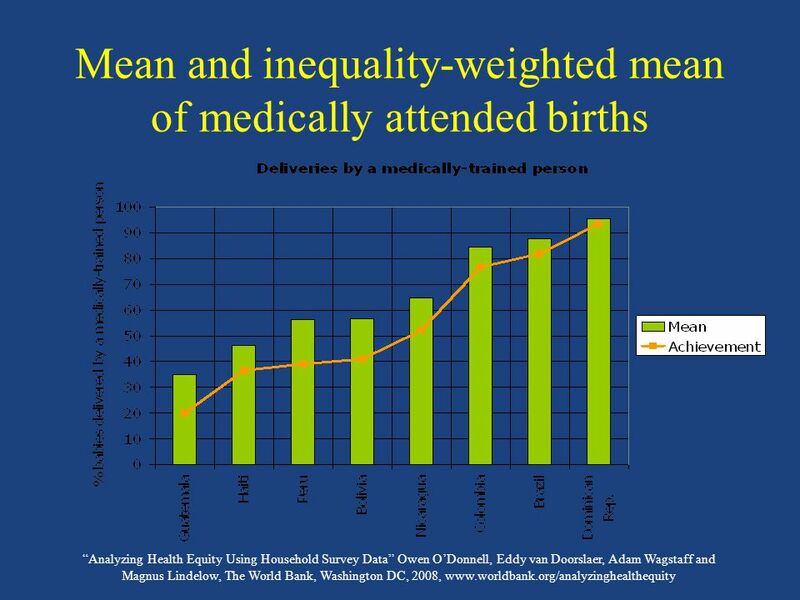 How can both inequality and the mean be incorporated into one index of health achievement? 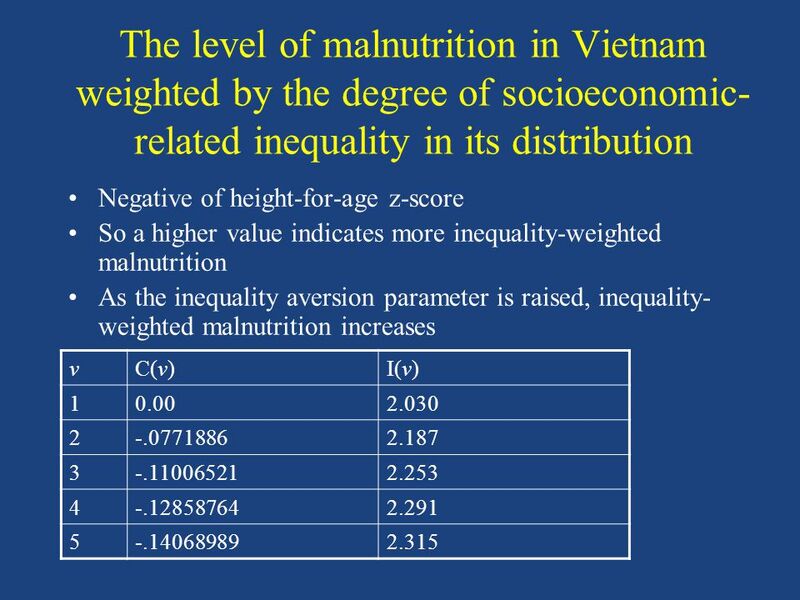 8 Taking account of the level and the distribution of health If there is concern for the level of health, and not only socioeconomic- related inequality in its distribution, then may want a summary statistic to reflect mean health in addition to this inequality. Might refer to such a measure as an index of ‘health achievement’. 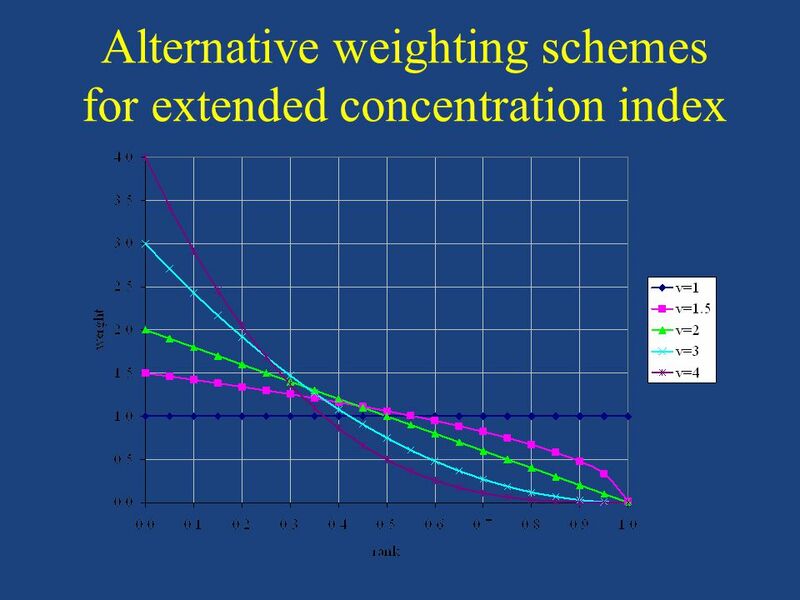 While the extended CI allows for different degrees of inequality aversion, it places no weight on the mean of the distribution. For example v=1, C(1)=0 irrespective of the value of the mean. 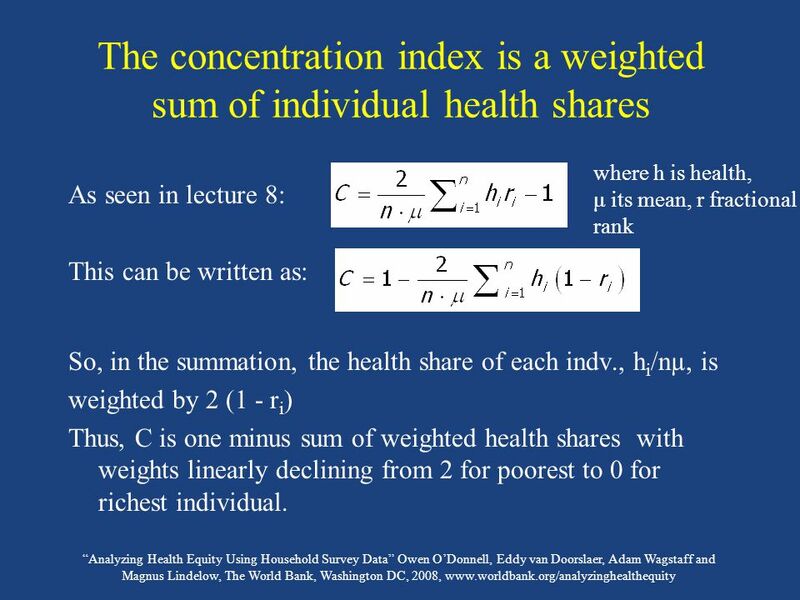 An index of health achievement can be obtained by taking a weighted average of levels of health, rather than of health shares, as follows: That is simply the product of the mean and one minus the extended CI. 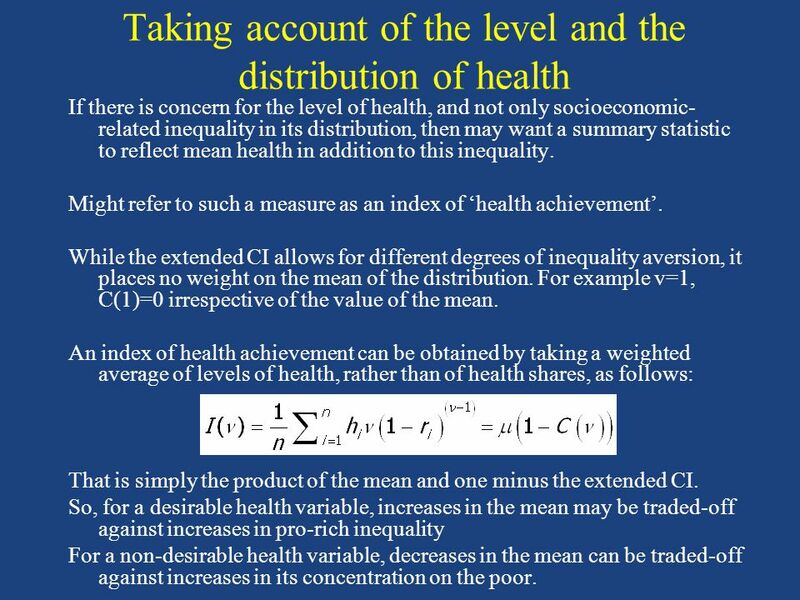 So, for a desirable health variable, increases in the mean may be traded-off against increases in pro-rich inequality For a non-desirable health variable, decreases in the mean can be traded-off against increases in its concentration on the poor. 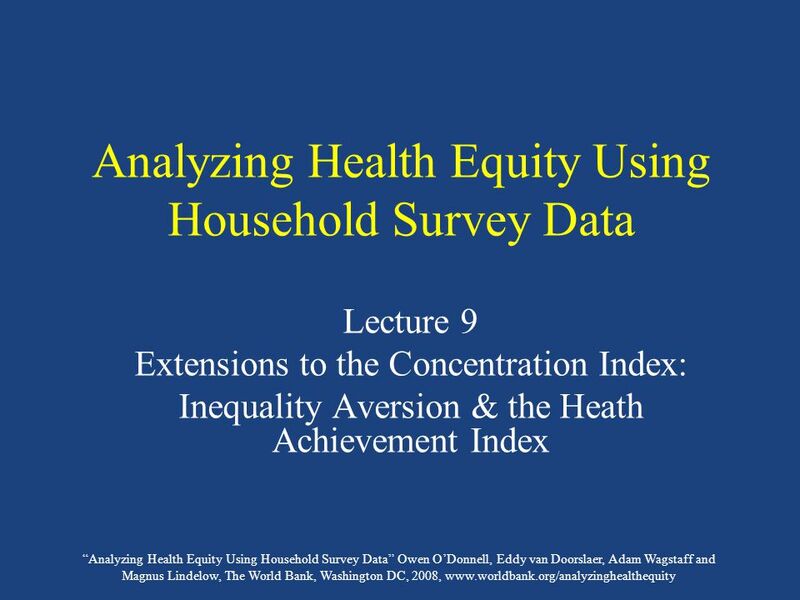 Download ppt "“Analyzing Health Equity Using Household Survey Data” Owen O’Donnell, Eddy van Doorslaer, Adam Wagstaff and Magnus Lindelow, The World Bank, Washington." World in Crisis Global Imbalances: Inequality in the World Today Dr Malcolm Fairbrother School of Geographical Sciences World in Crisis. DOES ECONOMIC GROWTH ALWAYS REDUCE POVERTY? MARC WUYTS INSTITUTE OF SOCIAL STUDIES ERASMUS UNIVERSITY OF ROTTERDAM. 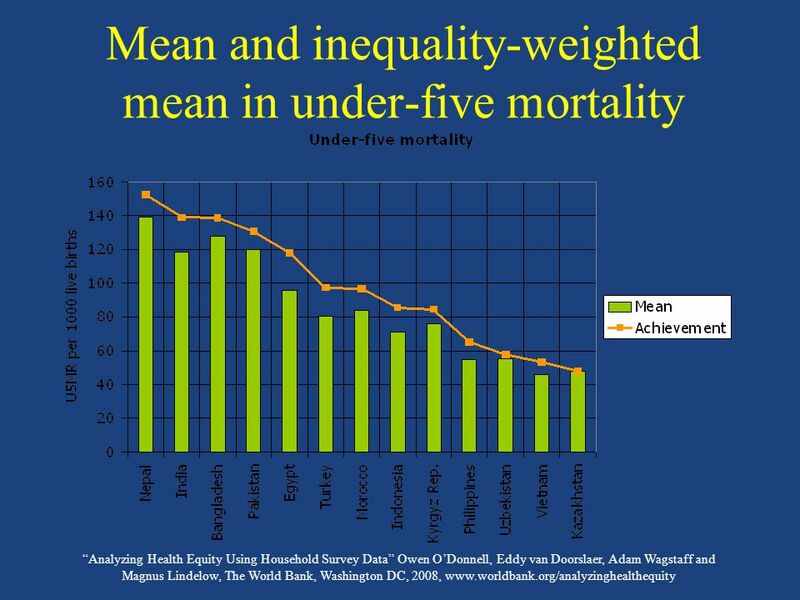 Is universal health coverage an option for developing countries to bridge health inequalities? JE. Ataguba J. Akazili March 16, 2011. Giving all children a chance George Washington University April 2011 Jaime Saavedra Poverty Reduction and Equity THE WORLD BANK. B/C – A and distributional issues (Cost Benefit Analysis DEC 51304) Zerbe & Dively Ch.11 R. Jongeneel. Assessing “Success” in Anti-Poverty Policy Lars Osberg Dalhousie University October 1, 2004. 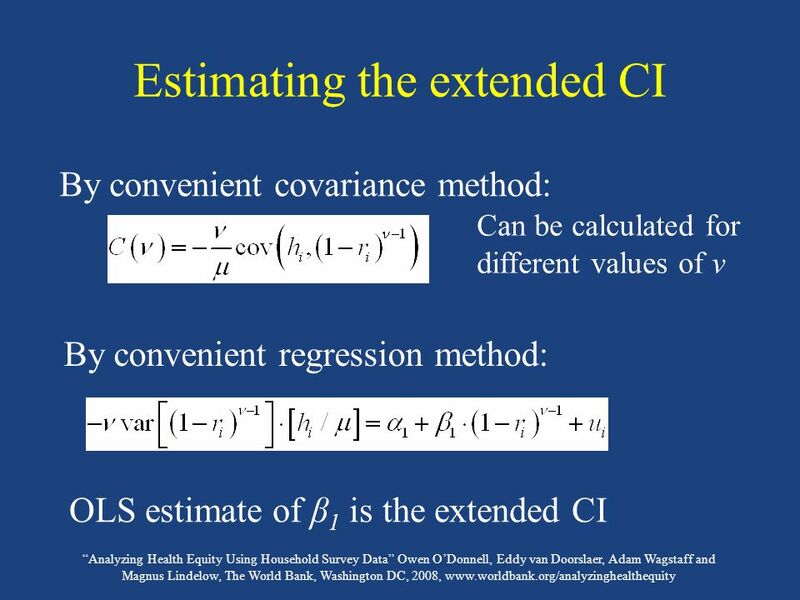 3.2 OLS Fitted Values and Residuals -after obtaining OLS estimates, we can then obtain fitted or predicted values for y: -given our actual and predicted.